I love talking plants. Many a conversation has started with “I have this site, and I’m looking for…” A round robin ensues with participants chiming in and suggesting possible plant selections. Often, other stipulations are given which limit possibilities. Recently a Wister Greenhouse volunteer initiated such a conversation. She was looking for a plant to create an informal screen between her property and her neighbor. She didn’t want something that needed shearing nor something that would grow so tall as to block the view and morning sunlight. 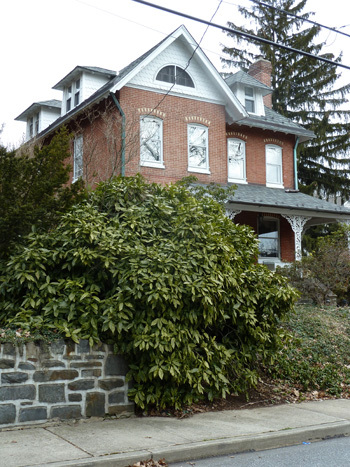 It needed to take shade and thrive in marginal soil. Also, the plantings had to withstand browsing as a deer trail bisected the property. Usually the responses were free flowing. Not in this instance. Perplexed, we all agreed to think on it. Sitting across the work space was a bucket used by flower arrangers to gather cuttings for arrangements. Several plants occupied the bucket but one in particular caught our eyes. 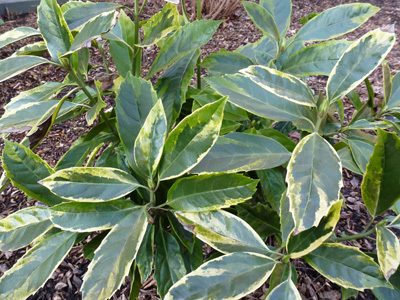 The glossy, bright evergreen foliage of Aucuba japonica ‘Rozannie’ was the solution plant. Aucuba thrive in shade, create evergreen hedges rarely exceeding 10’ in height, and I have yet to see any deer-browse damage. Several cultivars are planted around the Terry Shane Teaching Garden, including variegated varieties which add luminosity to shady garden areas. All agreed Aucuba was the best solution. 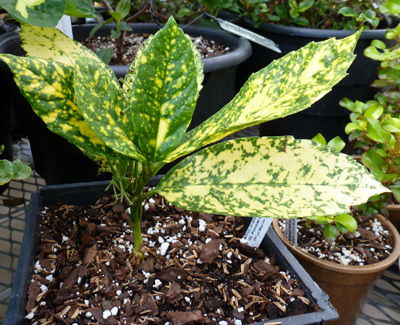 Hailing from Japan, variegated Aucuba japonica was first introduced in America in the late 1700s. 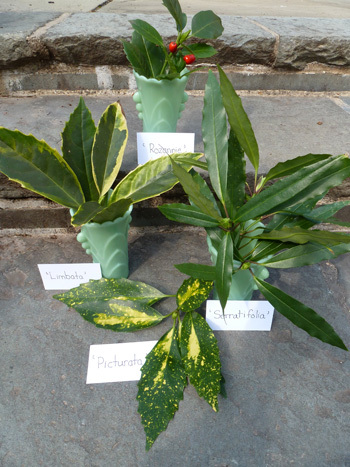 A majority of available cultivars are variations of the variegated Japanese aucuba and feature yellow margins, and splashes or blotches on the leaves. Mature plants range from 6’ – 10’ in height with a slightly smaller spread. Young plants can be slow to establish. 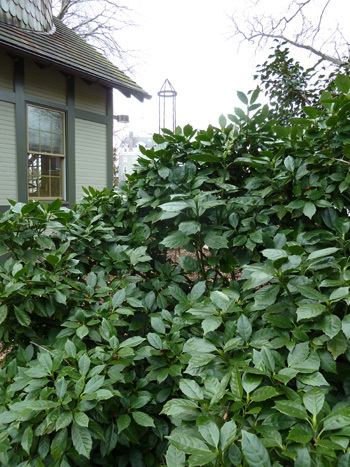 Once rooted, thick foliage creates a neat and tidy rounded shrub. Dioecious flowers, subtle in effect, open between March and April on separate plants. Female flowers yield shiny red drupes akin to those of Cornus florida. Fruits mature in autumn and persist throughout the winter. 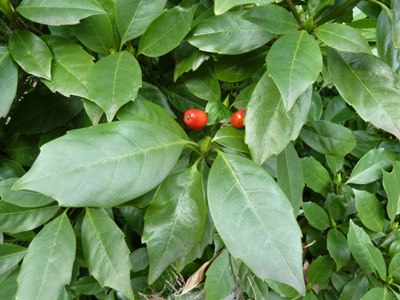 Literature lists Aucuba japonica as a zone 7 and warmer plant. The shrub was popular in the south but became less so after the deep freeze of 1983-84. I have not noted any winter damage during the last 3 winters. Andrew Bunting, curator, recalls winters where Japanese aucuba died to the ground. Plants remerged from the roots. The last occurrence of this happening was over 15 years ago. The Scott Arboretum holds a growing collection of aucuba. 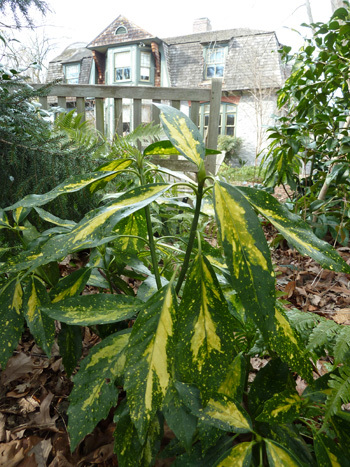 Aucuba japonica ‘Rozannie’ is a solid green cultivar noted for its compact habit and dark green foliage. A beautiful specimen is seen against the Off Campus Study building in the Entrance Garden. ‘Serratifolia’ also sold as ‘Dentata’ bears deep serrations along the leaf margin. A solid yellow blotch in the leaf center surrounded by yellow splotches characterizes ‘Picturata’. ‘Limbata’ features yellow-green margins with coarse serrations. ‘Mr. Goldstrike’ was recently acquired. The cultivar is so heavily spotted it appears chartreuse from a distance. Many other named cultivars are offered from nurseries such as Plant Delights Nursery, Inc. and Fairweather Gardens. Aucuba japonica is top rate! It creates a presence in the winter garden giving structure and form before slowly moving backstage to allow its warm weather neighbors to shine. A true team player, aucuba’s evergreen foliage complements just about every planting. Not without flair, variegated cultivars add a touch of light and brightness to the shade garden. It’s hard to ask for much more. All very true except for the deer part. I have clients where it is nibbled to trunk, and that is with spraying deer repellent. I have noticed more and more aucuba planted in the surrounding neighborhoods and all seem untouched. Deer do frequent the Arboretum and don’t browse, though I suspect there are many other more appetizing choices. When all is said and done I think deer will eat just about anything! I would have to agree with Thomas. In the growing season the deer leave my acuba alone, but when winter comes it can get eaten down to the stems. The damage is much worse than on the nearby azalea. 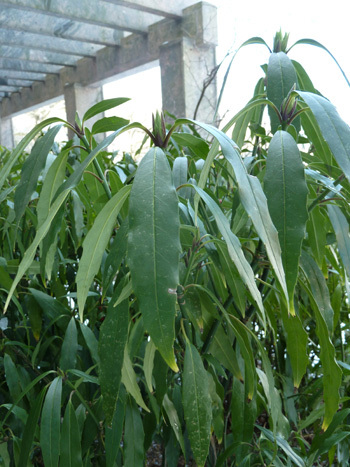 I would recommend Prunus laurocerasus (cherry laurel). It is as tough as the acuba and the cultivar I have (‘Schipkaensis’?) is about 8′ tall x 5′ wide. The deer have never touched it.